The shipment of rice harvested in two more districts in Fukushima Prefecture has been banned by the Japanese government after dangerously high levels of radioactive cesium were detected. The nation's Chief Cabinet Secretary, Osamu Fujimura, said the central government has instructed Fukushima Governor Yuhei Sato to impose the ban on rice harvested in the Oguni district and the Tsukidate district, both in the city of Date. According to the Japan Times, a combined 3,400 kg of unmilled rice harvested by two farms in the Oguni district and by one farm in the Tsukidate district contained between 580 and 1,050 becquerels per kilogram of radioactive cesium. The government's limit is 500 becquerels. 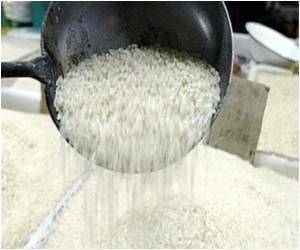 One of the farms in the Oguni district already has sold 9 kg of the tainted rice, the prefectural government said, adding it has yet to establish the identity of the buyer. It is the second ban on rice grown in Fukushima Prefecture in the last two weeks. On November 17, the government banned rice in the Onami district of the city of Fukushima after high levels of cesium were detected. According to the report, the prefectural government has also decided to inspect rice from about 2,300 farms in certain districts of Nihonmatsu and Motomiya where high radiation levels have been recorded.